10:55 I can’t believe I am down to the wire with this one. I’ll add more details after this basic post is up. ETA: I had so much fun creating this card, I say that a lot don’t I? I guess that is simply because I enjoy my craft so much!! LOL!! I dyed the seam binding ribbon myself using SU! reinkers, blush blossom and pretty in pink. I hand cut the grass fringe after cutting the CS’s edge with a scalloped paper punch. I used my Copic Airbrush system to create the background using Eclipse tape masks with the cloud dies from PTI. I don’t usually take photos during the day so my photo box set up never works in the day time. It isn’t too bad with editing but the bear and the kraft CS aren’t quite so orangey IRL. The button isn’t supposed to be tipped up, but as I literally finished it, threw it in the photo box and photographed it 5 minutes before the posting deadline, I hadn’t noticed to fix it! I also just noticed that one of the clothespins on the diaper cover snuck behind the ‘clothesline’. I’ll have to glue those in place I guess. 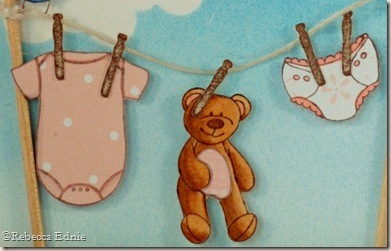 The onesie, bear’s tummy and the frilly diaper cover are all paper pieced with touches of Copic for detail and shading. If you notice, the DP’s flower is right in the middle of the image. Not an accident! I used sharp tipped, non-stick scissors to cut away the rubber from the center of the stamp so I could see the paper through it. Thanks for hopping by. If you just stumbled upon this blog hop, do start back at the beginning and check out all the links. This is a customer blog hop so you get to see creations by all of us who didn’t make the design team! Just kidding; I didn’t apply! But I am certainly will next time! Seriously, it is for all of those of us who love TE to get a chance to show off our work using their stamps. If you liked my project, I hope you will subscribe by email or RSS feed. Both are on my sidebar, the RSS one towards the bottom and the email one towards the top. You can see my project from the June Blog Hop here! Ink: Memento brown, Antique Linen Distress ink, night of navy-SU! This is super adorable, love the coloring and paper piecing! Excellent!! This is so cute, that bear just makes me smile!Chris L.
Absolutely adorable! Love the sweet little scene you created. The seam binding is beautiful! What a sweet baby card! This is absolutely adorable….what super sweet images and I sooo love the grass…amazing details!!! Oh, this is SO CUTE!!!! It just makes me smile looking at it!!! This is seriously so cute!!!! I love the shading under the images- noticed that right away. Love the flower on the diaper and the whole thing is just sweet!!! Love it! i just love this! The scalloped fringed grass is just wonderful! This card is adorable!! !I love the scene you created. Adorable!!!! This couldn't be any cutier.It's a good life!Terri E.
Very cute, this set is certainly a must-have! Holy guacamole! This is PRECIOUS! Adorable! Just adorable! All the little elements are just perfect! This may be the cutest thing EVER! LOVE the clothesline and all the items hanging from it! This is AMAZING!! !